Beacon Technology Market size was estimated at over USD 170 million in 2016 with a CAGR of over 80% from 2017 to 2024. The beacon technology market is gaining momentum due to consistently growing demand for proximity-based marketing solutions in the retail environment. As there is an increasing need for personalized service experience by customers, retailers are exploring modern technological alternatives for improving in-store advertising efforts. With smartphones poised to emerge as the ubiquitous technology of the 21st century, their rapid adoption around the world is boosting the growth of the beacon technology market. Moreover, government agencies around the world are focusing on developing smart city projects to modernize the urban infrastructure and create highly connected cities by leveraging cutting-edge technologies. Beacons are expected to play an important role in enabling such networks which can be managed at the micro-location level. The iBeacon platform is expected to dominate the market by 2024 with a significant market share of over 55% as the platform is the pioneer in introducing Bluetooth Low Energy (BLE) wireless technology. As various vendors aggressively began manufacturing and commercializing iBeacon compatible beacon transmitters soon after Apple launched this platform in 2013, it received the first mover’s advantage and captured a major share of the beacon technology market. The market share of Eddystone by Google, being the prime competitor of iBeacon, is expected to grow with the highest CAGR between 2017 and 2024, primarily because of the vast user-base using android mobile devices. As Google is constantly integrating its other widely popular services such as Google Maps with the platform, along with the Chrome support for Eddystone launched in 2016, the number of Eddystone compatible beacons is projected to increase exponentially over the timeline. 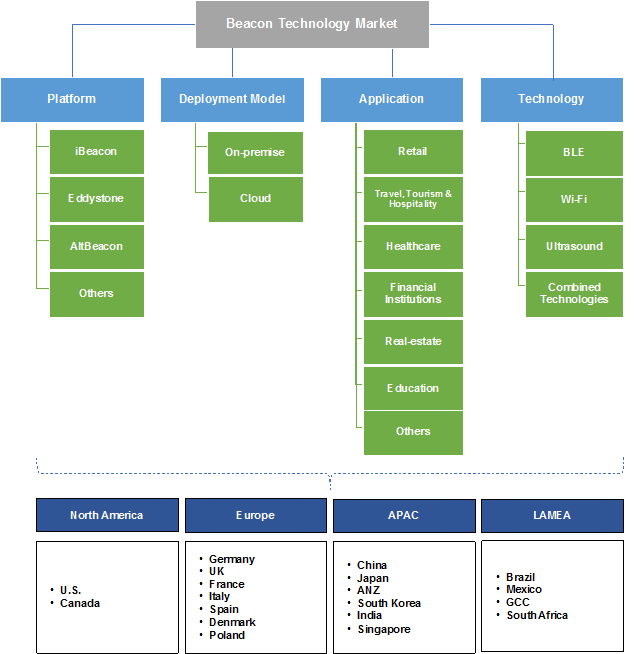 The on-premise deployment model holds the major share of the beacon technology market in 2016, and it is expected to maintain this dominance by 2024 as most of the beacon manufacturers offer low-cost beacon transmitters which makes it highly affordable even for small businesses to deploy them with minimal computing infrastructure. But, with increasing adoption of cloud computing technology and its capability of effectively manage large fleets of beacons deployed across wider geographical areas, the cloud deployment model is expected to exhibit fastest growth during the forecast period. The retail sector holds the most significant share of the market in 2016 and will maintain the largest market share by 2024 due to the large-scale adoption of beacon technology by retailers to efficiently implement proximity marketing campaigns. As it allows the retailers to push location-specific as well as customer-specific marketing messages onto the customers’ mobile devices in real-time, the success rate of marketing campaigns can be significantly improved. The healthcare sector is projected to witness high growth during the timeline owing to the capability of proximity beacons to enable improved healthcare management systems including efficient patient tracking, asset monitoring and healthcare security and compliance. With vendors introducing beacons designed specifically for using in sensitive hospital environments, the adoption is estimated to accelerate over the timeline. The technology is expected to grow with the highest CAGR between 2017 and 2024 as more and more retailers are adopting BLE beacons to cost-effectively deploy and manage proximity marketing campaigns and increase customer revisits and impulse purchases. Due to their highly affordable nature, larger networks of BLE beacons can be implemented for a relatively low cost compared to other wireless technologies. With increasing emphasis on improving the technology infrastructure and a booming retail sector, the APAC market is expected to grow steadily over the forecast period. With increasing awareness about beacon technology in countries such as Japan, Australia and India, the market will grow with the highest CAGR between 2017 and 2024. 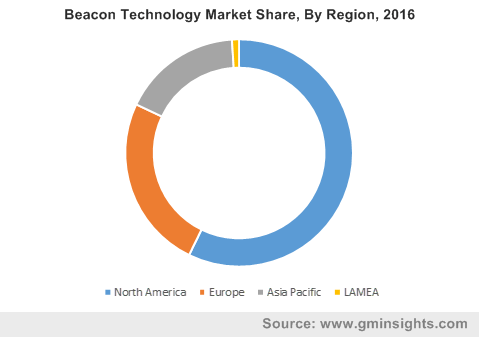 The key competitors in the beacon technology market are emphasizing on product development and innovation to introduce enhanced beacon products with improved capabilities such as wider range, water-resistant surfaces and cloud-based network management functionalities. The platform providers are focusing on incorporating better support for beacons to improve their security features and integrate them with existing wireless services. Some of the players operating in the market include Apple, Google, Radius Networks, Estimote, Kontakt.io, Gimbal, blueSense Networks, Swirl, BlueCats, Beaconinside, Glimworm Beacons, Onyx Beacon, Sensorberg, RECO, Madison Beacons and Texas Instruments. Beacon technology has revolutionized the field of proximity marketing by enabling location-based messaging functions majorly using BLE technology to detect mobile devices in the proximity of beacon transmitters. With a logical intersection of existing trends such as mobile devices and digital signage, the technology has enabled a customized communication channel between businesses and their customers. As the beacon landscape is expanding, companies are focusing on developing products that can be customized according to the customer’s needs for network and relevant branding requirements. The vendors supplying hardware such as chipsets and sensors are emphasizing on improving the network capabilities and battery life of the beacons to enhance their value proposition for the users.